Editable royalty-free map of Barbados in vector-graphic online store. The second-smallest independent country in the Western Hemisphere and the easternmost Caribbean Island, Barbados lies between the Caribbean Sea and the North Atlantic Ocean. It is located east of the Windward Islands and roughly 200 mi (320 km) north-northeast of Trinidad and Tobago. The low-lying island is composed of limestone and coral and almost totally ringed with undersea coral reefs. Barbados is situated on the Caribbean Tectonic Plate. Numerous inland cliffs were created by past seismic activity. Barbados is mostly flat, but a series of terraces rises from the western coast to a central ridge, culminating in the highest point, Mt. Hillaby (1,102 ft / 336 m), in the north-central part of the island. Hackleton’s Cliff at the eastern edge of the island’s central plateau rises to 1,000 ft (305 m) above sea level and extends over several miles. South and east of this elevated area is the smaller Christ Church ridge. They are separated by the St. George Valley. At one time this valley was covered by a shallow sea, with each ridge forming a separate island. Barbados has no rivers and little surface water of any other kind, but a few springs are fed by underground water stored in limestone beds and some water courses are temporarily filled by heavy rains. end of the island, flat rocks form a low, jagged rim to the ocean. The southern and northern ends of the island are known as South Point and North Point, respectively. The northeasterly trade winds that blow across Barbados’s eastern coast, which faces the Atlantic Ocean, moderate the island’s tropical maritime Caribbean climate. The weather is cool and dry between December and May, and hotter and humid during the rainy season between June and December. 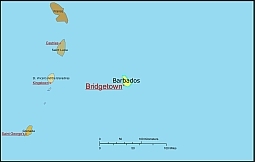 Temperatures in the capital city of Bridgetown range from 70–82°F (21–28°C) in February to 73–86°F (23–30°C) in June and September. Barbados’s most important natural resource is sugarcane; the sugarcane industry was the island’s most important economic sector until the 1960s, when it was surpassed by tourism. Barbados also has modest natural gas and petroleum resources and supports a fishing industry.